In the aftermath of the tabloid-riddled fever dream that was 2014, Toronto was desperately in need of a rebrand. 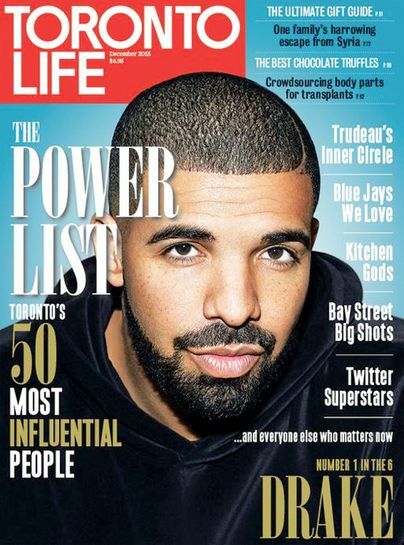 “The 6ix,” Drake’s pet name for the city, was weird and edgy and gave grammarians fits–but it stuck. And it marked the start of Drake’s dominant 2015, a year in which the actor-rapper blossomed into a concert impresario, clothing business guru, club king twice over, Raptors emissary, trademark maestro, rap battle victor and meme generator. He’s now our chief global headline maker–assuming the mantle from you-know-who. With his Dundas street storefront for his clothing line, the Sher Club at the ACC, the OVO Fest, a two-day annual hip hop festival that has sold out and included appearances from Kanye West and Pharrell Williams, his Fring’s lounge and becoming the fourth performer in history to reach 100 entries on the Billboard Hot 100 as did Elvis Presley, there’s no wonder Toronto Life has chosen Drake as one of the 50 most influential people. Of course my personal favourites, are the dubs remixed with soca. Enjoy!